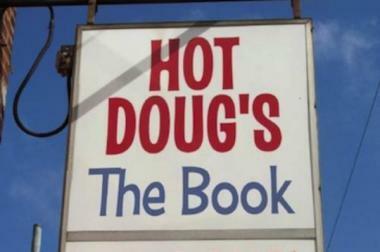 Hot Doug's: The Book will be released July 15, 2013. The book is available for pre-sale now. AVONDALE — Countless Chicagoans have spent lunchtime at Doug Sohn's iconic restaurant, Hot Doug's. But almost no one knows Sohn skips that meal every day he works. His ardent fans wait, at times for hours, to dine on Sohn's unique sausages and famous duck fat fries. Those supporters include Sohn's father, Dr. Herb Sohn, who stands in line to hear what others have to say about his famous son. "From listening, you can tell Doug's whole life is to want to make other people happy," said Herb Sohn, 85, a urologist at Weiss Memorial Hospital in Uptown. When customers finally reach Sohn at his familiar counter, they spend a few minutes shooting the breeze as they place their orders. But it's likely they don't know that Sohn has taken only one bathroom break during dining hours — when he had a horrible case of the stomach flu — since his restaurant's current location, 3324 N. California Ave., opened in January 2005. "There are many mysteries about that man, and that is one of them," said Hot Doug's employee Justin Graham, a Logan Square resident who has worked for Sohn for eight years. 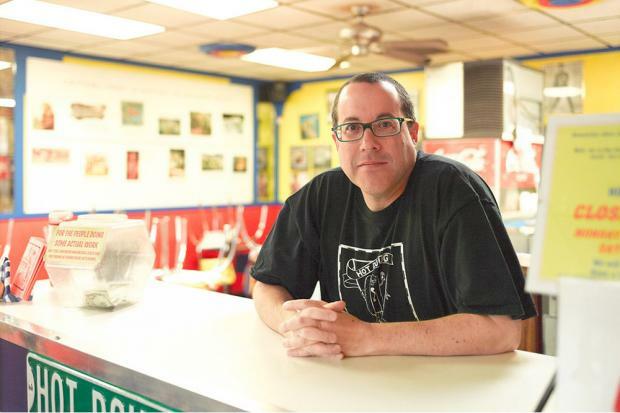 Sohn is loved by thousands of fans, many of whom are included in "Hot Doug's: The Book", which will be released July 15 and is available for pre-release purchase. But perhaps the adoration of Sohn can be summed up by his biggest supporter and girlfriend of 16 years, Barbara Tyksinski. "I have been told by my family that if I screw up with him, that they're taking him and getting rid of me," said Tyksinski, an Edison Park resident. Doug Sohn already has his funeral planned, and it's no ordinary deal. The 50-year-old wants to go out "Viking style" — put on a raft, set on fire and pushed out into Lake Michigan. "And people will be celebrating with hot dogs and champagne and scotch," Sohn said. That type of quirkiness is a part of Sohn, who said he owns just two black suits but a plethora of black Hot Doug's T-shirts and chef pants, which he always — always — wears at Hot Doug's. Sohn's most prized possession? A 1972 Official L.A. T-Birds Roller Derby Jamming Helmet. "It's the one thing I would save if there was a fire at my house besides pictures," said Sohn, whose subdivision in Chicago is an oddity in itself as it's not in an official neighborhood and instead surrounded by North Center, Avondale and Logan Square. Sohn's closest friends say his uniqueness is what makes his restaurant successful. "He was always walking a different line," Herb Sohn said of Doug, who tried majoring in computer science, philosophy and Italian at Columbia University in New York after graduating from the Latin School of Chicago in 1980. Tyksinski, who met Sohn 20 years ago in the culinary arts program at Kendall College, said her favorite thing about him is his wit. "He has an amazingly smart sense of humor," said Tyksinski, who runs All on the Road Catering in Park Ridge. "I started dating him because he made me laugh, and he still makes me laugh." Kate DeVivo, the co-author with Sohn on "Hot Doug's: The Book," said her friend of 18 years is "nice, genuine and straightforward who makes memorable experiences" for everyone going to his restaurant. His best bud, Bill Ryan, who has known Sohn for 30 years since their days as freshmen at Columbia University, said Sohn's demeanor is a big reason for the restaurant's success. "Doug works very, very hard at it and he pours his self into it," said Ryan, a lecturer at the Harvard Kennedy School of Government. "It's the perfect calling for a control freak like him." Sohn said he's put just as much effort into his book, which retails for $20 and will contain about 200 pages. DeVivo, of Edgewater, said the book will come in sections, including the concept and history of the restaurant, and customer experiences. Sohn wants to sell at least 50,000 copies — about the same amount Ryan sold of his book, "Governance as Leadership: Reframing the Work of Nonprofit Boards." "It's hard to know whether an esoteric book on a deadly boring topic like nonprofit governance will be more appealing than a puff piece about a hot dog store," Ryan said. "That's for the American people to decide." Based on Sohn and his restaurant's popularity, he might be able to top Ryan's book total. On busy days, Sohn said he can serve between 700 and 800 sausages. More than 22,000 people "like" the Hot Doug's Facebook page. Sohn was recognized several times during an interview with a reporter at an area Starbuck's. Tyksinski said Sohn was stopped once by an admirer at an airport in Costa Rica. Despite all that, Sohn thinks his book's publication finally will "legitimize" his restaurant. "That's obviously ridiculous because the restaurant is totally legitimate and awesome, but I think it's interesting that he feels that way," DeVivo said. "There's definitely still a part of Doug that still to this day can't believe he has his own restaurant."